The relationship between Twitter and television is important for both parties, even if there’s a bit of a disconnect between the sorts of shows real people are watching in their homes and what they’re actually talking about on social media. For example, The Big Bang Theory gets 20 million viewers week in, week out, but nobody is really talking about it on Twitter. Conversely, a show like The Walking Dead, which has about half Big Bang’s audience, dominates social discourse, ranking as the top show on Twitter every time it airs. That is, except this week. Except for the Oscars. The 86th Academy Awards was seen by 43 million people – about three to four times The Walking Dead‘s audience – and for once that mass appeal also registered on Twitter, and then some. 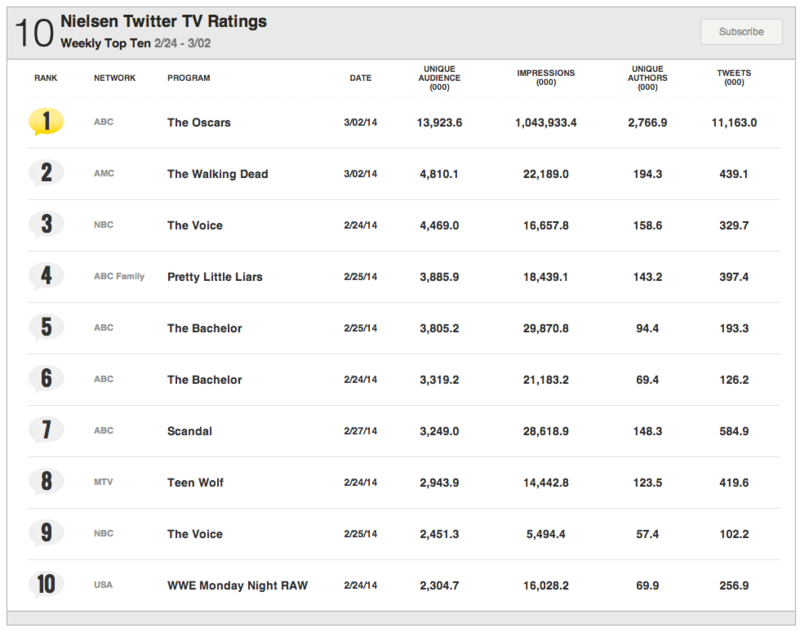 Measured by impressions, tweets about the last episode of The Walking Dead were seen about 22 million times on Twitter. Conversely, tweets about the Oscars picked up more than one billion impressions. Which is about four tweets per active user. Here are the top 10 most talked about TV shows on Twitter this past week.